Although I don’t have and never plan on having children (do not question my life choices, thank you), I often find myself thinking about how I would react as a parent to a situation or what choices I would make as a parent. Like, would I spank my child or use time out or figure out some new ingenious punishment not yet thought of? Would I send my kid to public or private school? And how would I handle that pesky God question if they asked? Mostly I find that my answers are either the same as I experienced growing up or in complete reaction to the way my mother raised me. And mostly the latter. I think that’s the norm, right? Strangely enough, the one that stumps me the most is how would I react to a picky eater? I mean, those definitely happen to food-obsessed parents. And how on earth would I deal with that? See, I was a picky eater as a kid. Looking back, I realize maybe I wasn’t nearly as picky as I perceived myself to be (I was constantly told how awful I was by favoring some foods over others–note to others: never do that to a child)–after all, I adored broccoli–but I definitely shunned certain foods like all fruits and salads or raw vegetables. Steam, roast, generally cook a vegetable and I probably liked it. But serve it to me raw? No way jose. My mother mostly chose to allow me to eat as I pleased–within reason. We ate the typically Midwestern meal of some form of potato (mashed or baked), meat (chicken, pork, beef, whatever), and a cooked vegetable (peas, green beans, broccoli, etc.) so I was mostly ok nutritionally. Not great but definitely not bad either. She was a working single parent and chose her battles wisely, so fruit and salads rarely made it onto the ‘eat this before you leave the table’ list. But one weird, strange, and hilarious memory stands out to me–the tofu on pizza night. For whatever reason, my mother found herself in possession of a block of tofu (a silken, soft variety) and had no idea what to do with it or how to make us eat it. It was a Friday or Saturday night and we had friends over to watch a movie or play games or something like that and she was throwing together large, homemade pizzas for us–pepperoni and probably not much else besides mozzarella and sauce. And then it comes to her–my daughter loves feta cheese! (See, I wasn’t that picky if I liked feta…) This tofu is just like the consistency of feta! If I crumble it on top, it will look like melted feta and she’ll never know the difference. Oh trust me, dear readers, I knew. And I refused to eat tofu again for a very, very long time. Oh that trickery. Oh that deceit. So would I sneak ‘healthy’ foods into my hypothetical children’s diets? In a large bowl, toss the tofu with 1/2 of the herb & spice mixture along with 1 tsp olive oil. Add more oil if necessary to fully coat the tofu with the herb mixture. Transfer the tofu to one of the baking trays and spread out evenly in one layer. In the same bowl (likely with some of the herb and oil mixture still in it), toss the potatoes with 3/4 of the remaining herb mixture and another tsp of olive oil. Coat the potatoes completely and transfer to the other baking sheet. Meanwhile, in a large skillet, warm 1 tsp olive oil over medium heat. Add the remaining herb mixture along with any left in the mixing bowl and cook for 1 minute, until fragrant. Add the kale and cook until tender, 5-6 minutes. 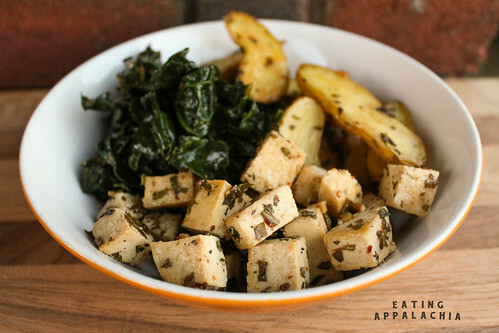 Serve the potatoes, tofu, and kale together for a warm, hearty meal. i didn’t think i wanted children for the longest time, but over the last couple years that maternal instinct and clock has emerged and now it’s all i think about. it’s quite a shock to me, for sure. the picky eater thing doesn’t scare me too much though since i already deal with a picky eater. i’ll probably say something like, “you can choose to eat daddy’s dinner or mommy’s dinner”, haha. and your sweet mom putting crumbled tofu on pizza. i wonder how she got ahold of it to begin with? i’m still on the fence with tofu, but i’m thinking i may make these herbed potatoes for my picky eater tonight! Well, I am staying in a house containing children right now, and I will say that when you spend time with kids, every question you can imagine will come up. It’s not an if. The picky eater thing is tricky, but I don’t think hiding healthy ingredients in another food is a good answer! It’s more about calmly presenting things for them to try, as far as I am tell. ANYWAY, kids are not going to be an issue at our house either, so whatever. And I would be all about scarfing down a big plate of this tofu, even if any kids in question threw their plates across the room. This sounds similar to a family favorite around here: baked tofu, udon noodles, and sauteed greens. I’m definitely going to make this for Dave – he will LOVE it! Yr fingerling and tofu dish looks just about perfect. I support this meal as well. That is a delicious bowlful of yum. I do the same exact thing and usually end up gleefully fantasizing that I’d sneak spinach into their pancakes and squash into their waffles and they would delightfully dig in and finish every last crumb. I’d wipe my hands on my tidy apron and sigh with contentment in my perfectly gleamingly clean kitchen. lol…yeahright. I’m happy enough munching on tofu bowls, thank you. This sounds delicious! Also, I am also in the no-kid camp, but I spend a lot of mental energy thinking about how I would raise my imaginary children. Silly brain! Oh, Jes. I hear you, and I hear you! I also never plan on having children. No thanks. I used to be a picky eater too, but looking back I also don’t think I was as picky as I thought either. My mother used to cook very chunky “adult” foods, and I liked smooth-textured dishes that didn’t offend my delicate little tongue. “You don’t want to eat your dinner? All those poor children starving in Africa and you turn your nose up at this perfectly good stew?” Thanks to all that crap I had a horrible relationship with food until my mid twenties. Goopy silken tofu and feta? Same thing! You would not have to sneak that yummy tofu and potatoes into my diet! Give it to me! I had not planned on having kids; however, it did happen, and I love my son dearly. He was definitely a picky eater. My rule was, try one mouthful. If you don’t like it fine, but don’t taste it with your eyes. I had been a picky eater as a child myself and I had on more than one occasion actually thrown up what was served to me. So, I never pushed him to eat something if he didn’t like it. Even now, at 30 years of age, he often tells me he just discovered something is delicious. And I always tell him, people’s tastes change over time.